Heavily armed search teams detected evidence of activity in the woods and eventually found John D. Williams outside a small, remote camp in Fairfield. Police searching for suspected cop killer John D. Williams were confident they had contained him in the marshy, wooded area near Bear Mountain and Lost Brook, west of Route 139, where the towns of Norridgewock and Fairfield meet. “Each day we assembled teams from federal, state, local and county agencies to slowly and methodically search the difficult terrain – each day moving, searching for evidence and any signs of movement by the suspect,” Maine State Police Lt. Col. John Cote told reporters Saturday afternoon. Police say Williams, 29, of Madison shot and killed Cpl. Eugene Cole of the Somerset County Sheriff’s Office in the early morning hours of Wednesday in Norridgewock. Cole, a 13-year veteran of the sheriff’s office, was the first Maine police officer fatally shot in the line of duty since 1989. Police said Williams then stole Cole’s cruiser and tried to rob a convenience store in Norridgewock. Cole’s cruiser was later found abandoned on Martin Stream Road in that town, and Williams was on the run. What followed over the next four days was a sprawling, frantic manhunt involving an estimated 200 armed police officers, sheriff’s deputies and game wardens from all over Maine, as well as New Hampshire and Massachusetts, along with federal authorities from the FBI, the Bureau of Alcohol, Tobacco, Firearms and Explosives, the U.S. Border Patrol and the U.S. Marshals Service. It ended with Williams’ arrest about 12:43 p.m. Saturday on Norridgewock Road in Fairfield, not far from the search grid marking a wide area around Martin Stream Road. The handcuffs that police placed on Williams were the very ones that Cole had used. 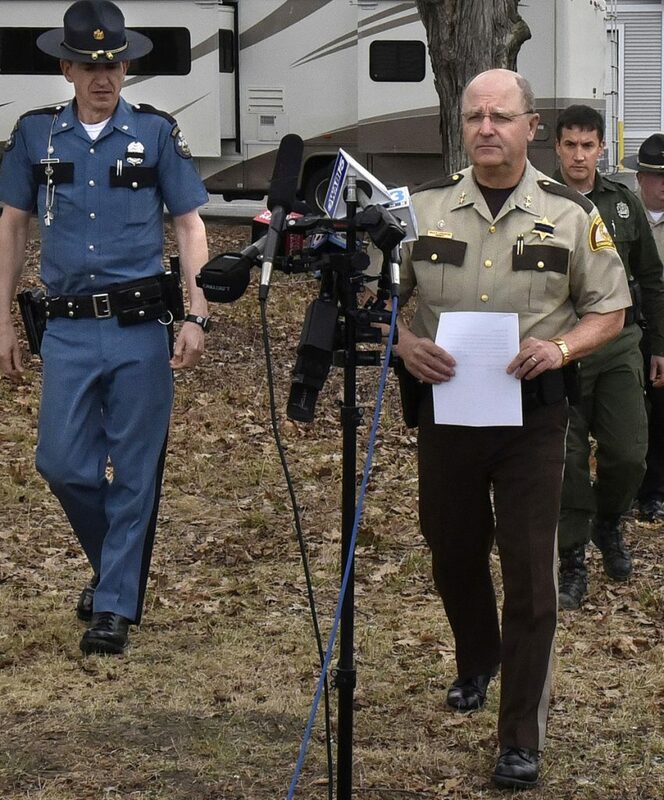 “I thought that it was fitting, where he killed my deputy – Corporal Gene Cole – and he was brought to justice using Cole’s handcuffs,” Somerset County Sheriff Dale Lancaster said during a final briefing on the manhunt Saturday afternoon. Cote – who is second in command of the Maine State Police and is soon to be sworn in as a colonel and chief of the force – said that during the search, police had to be on guard for the possibility of a continuing threat from Williams, whom they had determined to be armed and dangerous. He said critical evidence was found – foot tracks and other signs of human activity – during the searches. Each day the teams – heavily armed and some with search dogs – covered more ground and set target ground to be covered the next day, Cote said. Helicopters were sent up when the weather was right. “Throughout the week we found tracks that appeared to be fresh,” Cote said. On Saturday, one of the search teams found Williams outside a small, remote camp in the area of Lost Brook. 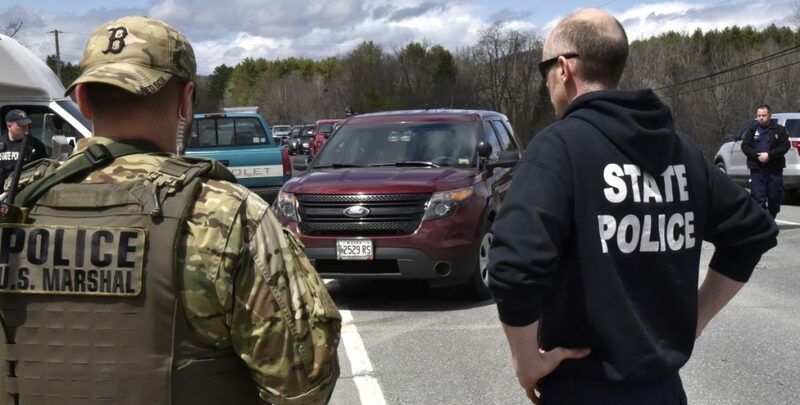 “In a testament to the teamwork that has been evidenced throughout this case, the seven-man capture team was comprised of members of the Maine Warden Service, the Maine State Police, the Fairfield, Maine, Police Department and the FBI,” Cote said. Williams was taken to the Maine State Prison in Warren rather than Somerset County Jail in East Madison at the request of county jail officials, said Joseph Fitzpatrick, commissioner of the Maine Department of Corrections. In a statement Saturday night, Fitzpatrick called Williams’ diversion to the state prison a “routine process” used when a county jail has an inmate who requires additional security precautions for secure confinement while awaiting trial or sentencing. Fitzpatrick said state police arrived at the state prison with Williams about 5:30 p.m. Saturday. He was received, screened by medical staff and placed into secure housing. A prison official confirmed Williams’ presence there Sunday but would not release any other information. Authorities had initially said that Williams would be taken to the Maine Correctional Center in Windham. Williams is expected to make his initial court appearance this week, but it could not be determined Sunday night exactly when or where that will be. The state police Major Crimes Unit is investigating the slaying of Cpl. Cole, and the Maine Attorney General’s Office will prosecute the case. Cote said police have learned from previous manhunts, including that of Robert Burton in 2015, to establish a plan early in the investigation. The long ordeal began at 1:42 a.m. Wednesday with a report of a robbery at the Cumberland Farms store on Waterville Road in Norridgewock. A man, later identified as Williams, was seen entering the store on video footage from the dashboard camera of Cole’s marked cruiser. Hours later, Cole’s body was discovered in a woman’s yard on Mercer Road, also known as U.S. Route 2, near downtown Norridgewock. Investigators learned that Williams had lived in that house as a teenager after he had a falling-out with his parents. Police said Williams, who was scheduled to appear in court that day in Massachusetts on gun charges, had shot Cole and stolen his cruiser. The fully marked cruiser was found abandoned on Martin Stream Road in Norridgewock. Precious few details on the shooting and the ensuing manhunt have been released by police. “There will be times when that information comes out throughout the process, but this is not the time for those details yet to be released,” Cote told reporters on Saturday. After Williams’ capture, police said only that he was not injured and that he was checked by medical personnel before being taken for questioning to the Waterville Police Department. He was later transferred to the state prison in Warren. Cole, 61, had been involved days earlier in the arrest of Williams’ girlfriend, Kristina Pomerleau, on charges related to cocaine possession, but police were tightlipped as to the details of that relationship and whether it had anything to do with Cole’s death. Pressed by reporters Saturday, Cote would not say if Williams was armed when he was apprehended. He said Williams was the only suspect in the shooting, but would not offer details about how police knew that. The arresting officers were not wearing body cameras, he said. Police have not said if Cole was on duty when he encountered Williams, although the radio log from the communications center lists Cole – his call number Somerset 1312 – as being one of several units dispatched to the robbery report at Cumberland Farms at 1:42 a.m.
Police also have not said if it was Cole’s weapon that was used to kill him or if the weapon was found. Cole’s body was not discovered until 7:15 a.m. Wednesday. Authorities said Cole was shot between 1 and 2 a.m. The cruiser was found abandoned shortly after 5 a.m. off Martin Stream Road in Norridgewock, police said. “We believe the suspect then fled the vehicle on foot,” state police said in a news release Wednesday morning. Police have offered no motive in the killing. It also is not clear if Cole’s cruiser had a GPS device that would have made it easier to track. Police would not say if Williams had food or supplies to help him survive the cold, wet weather in woods or if he had been in contact with anyone while on the lam. Around 11:15 a.m. Wednesday, Cole’s body was taken out in a state police evidence response truck with a state police cruiser ahead of it, lights flashing, en route to the Medical Examiner’s Office in Augusta. A shoulder-to-shoulder line of police officers stood at attention near the scene. As the procession left, a flurry of police sirens echoed across the downtown. Officers stood at attention and saluted as the body was delivered to the Medical Examiner’s Office in Augusta. Cole’s body was returned to Skowhegan amid a procession of police cars, lights flashing and sirens blaring later in the day. Visiting hours will be held from 4-7 p.m., Sunday, May 6, at the Skowhegan Armory, 11 North School St., Skowhegan. A celebration of Cole’s life will be held at noon Monday, May 7, at the Cross Insurance Center, 515 Main St., Bangor, with Chaplain Kevin Brooks officiating. Portland Press Herald Staff Writer Beth Quimby contributed to this report.